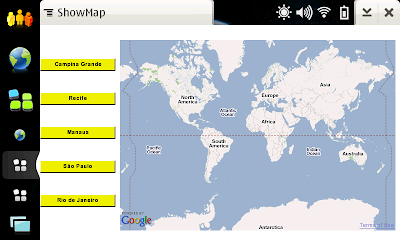 In this post, I will present an application that shows some city locations by using QWebKit and Google Maps API. Before starting the real implementation, we need to build the application GUI (Graphical User Interface). Qt offers a strong tool called Qt Designer to build GUIs. In this example, we used Qt Designer to create the application form. Such a form contains five buttons (QPushButton) and a web view (QWebView). You can add new Qt components inside a form by dragging and dropping elements from Widget Box. The properties like name and label of a Qt component can be changed through the Property Editor. Implementing: NOTE: Usage of this code with the free Google Maps API Key breaks Google's Terms and Conditions (section 10.8). You should purchase an Enterprise License if you wish to use the Google Maps API as shown in this example. First, we need to implement a custom QWebView component. In this example called Map, such a component has some additional services that allow us to show the city locations in a map using the Google Maps API. 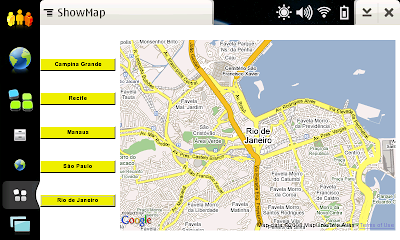 The main service of the Map component is implemented by geoCode method. The geoCode method requests the coordinates of the given local, by using the Google Maps API. The geoCode response is received by replyFinished method. Such a method parses and stores the coordinate (latitude and longitude) in array of coordinates. After that, the reloadMap signal is emitted. The MainScreen uses the Map component to show the map with the city locations. 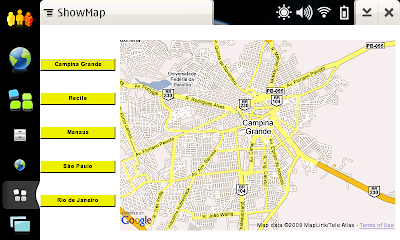 For example: when the button1 is clicked, the geoCode method is invoked passing Campina Grande as the city to be shown.